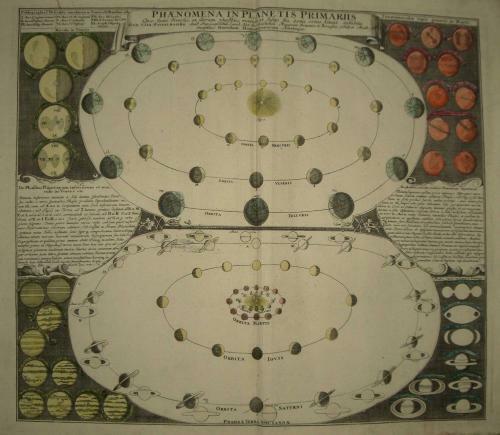 Celestial chart of the major planets by J. G. Doppelmayr, published 1742 by Johann Baptist Homann, Nürnberg, 1742. Explanation of the phases of the planets as seen from the Earth (Mercury, Venus, Mars, Jupiter, Saturn), observed by Christoph Scheiner, Galileo Galilei, Christiaan Huygens, Giovanni Domenico Cassini, Robert Hooke, Jacques-Philippe Maraldi and Francesco Bianchini. Some minor stains, otherwise very good condition.